Our mounting deficits and long term debt have become our country’s greatest national security threat. Raising the debt limit without making serious changes to how our country spends money would send the wrong message and create greater financial uncertainty. 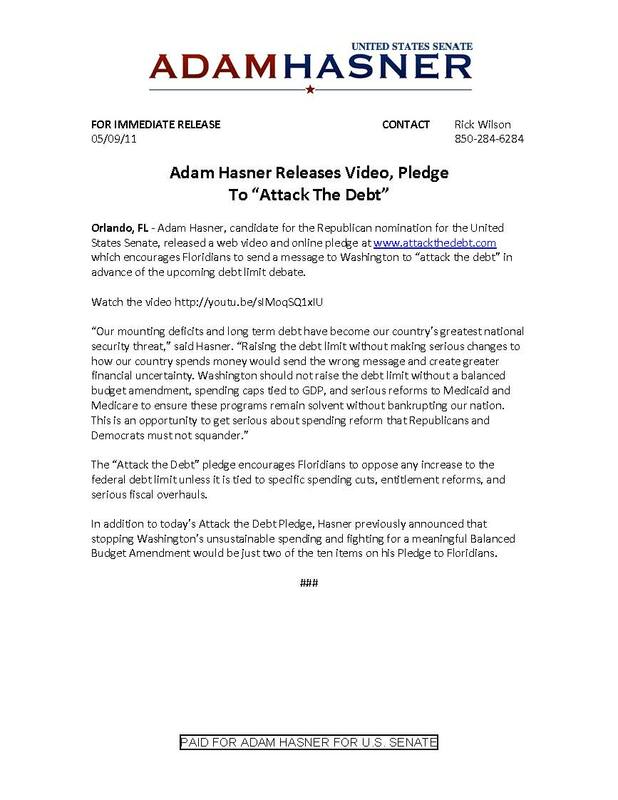 Washington should not raise the debt limit without a balanced budget amendment, spending caps tied to GDP, and serious reforms to Medicaid and Medicare to ensure these programs remain solvent without bankrupting our nation. This is an opportunity to get serious about spending reform that Republicans and Democrats must not squander. You can read more about Adam Hasner's plan to Attack the Debt and the rest of his "Pledge to Floridians" here.